In 1797 and 1798 Coleridge wrote 3 poems which had no equal and which he himself was never again to equal or approach: "Christabel," "Kubla Khan" and "The Ancient Mariner." These three poems are concerned with the supernatural. Both "Kubla Khan" and "Christabel" are fragments while the Ancient Mariner is complete. The first problem for any poet of the supernatural is to relate it to familiar experience. But Coleridge could not rely on his reader's feeling at home with his unfamiliar theme. He must relate his theme to something which they knew and understood, something which touched their hearts and imaginations, and he did this by using some characteristics of the dream. Dreams can have a curiously vivid quality which is often lacking in waking impressions. They have, too, a power of stirring elementary emotions, such as fear and desire. The Mariner commits a hideous crime when he shoots the albatross. He is haunted by the presence of his dead comrades, and he carries a gnawing memory to the end of his days. His comrades were doomed to die because they helped him in his crime when they said the imaginary world has its own rules which are different from ours. They are more convincing than most events in dream. The Ancient Mariner has its own casual relations between events and lives in its own right as something intelligible and satisfying. It is clear that Coleridge felt about the creations of his imagination something similar to what he felt about dreams. When we have them, we don't question their reality. However unnatural his events may be, they are derived from natural elements, and that is why we believe in them. We may even be at home with them because their constituents are familiar and make a direct, natural appeal. Once we enter this imaginary world, we do not feel that it is unreachable, but rather we respond to it as we would to actual life. Coleridge understood the extremes of despair and of joy, and he distilled them into these brief moments. Because his poem moves between such extremes it has a certain spaciousness and grandeur and reflects through its variations the light and the shadow of human life. Coleridge expects us to believe that his situations are real, and to have some kind of human feelings about them. This is easy if they belong to the ordinary experience, but when supernatural takes place it demands a more unusual art. Then Coleridge makes the supernatural look as natural as possible because, however strange it may be, he forms it from elements which are in themselves familiar. The Romantics knew how to use their senses, and Coleridge, despite his love of metaphysical abstractions, was in this respect a true member of their company. He used nature to give color and music, solidity and perspective, to his creations, and it is one of the chief means by which he sustains the enchantment of his poem. When Coleridge wrote the Ancient Mariner, he believed in the imagination as a vehicle of truth. Coleridge thought that the "secondary imagination" with which poetry is concerned, is itself concerned with eternal values. For Coleridge a symbol is something which presents the eternal in a temporal, individual shape. He means by eternal belonging to the world of the absolute values, a symbol's task is to present in poetry an instance of universal truth. "The Ancient Mariner" passes beyond its immediate purview to something remote and vague. In other words, "The Ancient Mariner" is a myth. It presents in an unusual and lively form certain issues with which we are all familiar and forces us to look afresh at them. It draws attention to neglected or undiscovered truths. This is what Coleridge believed to be the task of poetry. Through creation the poet reveals the secrets of the universe, especially in the sphere of absolute values. The myth is only one kind among many kinds of poetry, but it is specially adapted to Coleridge's outlook because it can deal with the supernatural issues. It is an extension of the use of symbols. In "The Ancient Mariner," he shapes these symbols into a consistent whole, and subordinates them into a consistent whole, and subordinates them into a single plan, so the poem is in the first place a story which we enjoy for its own sake, but in the second place a myth about the dark and troubling crisis in the human soul. 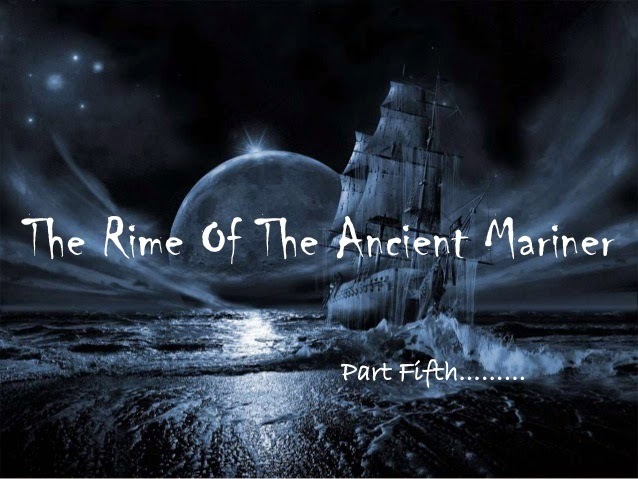 "The Ancient Mariner" is a tale of crime and punishment. It falls into seven sections. What matters is the imaginative and poetical effect, the emotional impression which the words make on us. Coleridge in his myth shows the essential qualities of crime and punishment. He shows what they are and what they mean. He goes to the heart of the matter in its universal character. In the first section, Coleridge tells the actual crime. To use the shooting of the bird may seem a normal act, but to Coleridge it is significant in two ways. First, he does not say why the Mariner kills the albatross. The Mariner may be annoyed or angry, but what matters is the uncertainty of the Mariner's motives. Secondly, this crime is against nature, against the sanctified relations of guest and host. The bird, which has been hailed in God's name "as if it had been a Christian soul," and is entirely friendly and helpful, is wantonly and recklessly killed. At that time Coleridge was obsessed by the Neo-Platonic ideas of the brotherhood of all living things. Perhaps he was, but it does not matter. What matters is that the Mariner breaks a sacred law of life. In his action we see the cruelty of many crimes against humanity and the ordered system of life and the killing of the albatross as symbolical of them. The Mariner's need to confess is appropriate, because by forcing others to listen to him he regains some of that human converse of which his crime has robbed him. Coleridge doesn't tell the end of the story, but leaves us to suppose that the Mariner's sense of guilt will end only by his death. "The Ancient Mariner" is a myth of guilt and redemption. Though Coleridge has his own poetry of a guilty soul, it is not comparable in-depth or in insight with the poetry of some other men who have given the full powers of their genius to writing about crime and the misery it engenders. Much of the magic of "The Ancient Mariner" comes from its blend of dark and serious issues with the delighted play of creative energy. Coleridge fashioned his poem in this way for two reasons. In the first place, the combination of different themes responded to his own complex vision of existence. For him life had both its dark and its bright sides. He saw that the two were closely interwoven and he must introduce both into his poems. In the second place, he saw life not analytically but creatively, and he knew that any work of creation must itself be an extension and enhancement of life. In creating "The Ancient Mariner" in this way Coleridge obeyed the peculiar and paradoxical nature of his genius. In him the poet and the metaphysician were uneasily blended, and the creative spirit worked most freely when it was free from metaphysical speculations. His three great poems owe nothing to his study of philosophy or his own conscious theories about the universe. Only when he was free from the topic which engaged his philosophic curiosity was he able to release all his imaginative powers. In the Ancient Mariner he does indeed treat a subject of universal interest, about which philosophers have had something to say, but he succeeds in making it poetry just because he keeps at some distance from his habits of abstract thought. Coleridge felt the attraction of the supernatural. What touched his genius was his sense of mystery at unknown forces at work in life, and to keep this mystery intact he needed some subject which was in itself mysterious. He saw strange powers behind the visible world, and he believed that men were moved and directed by them. To show this he needed characters and circumstances in themselves strange and arresting. Once he found a subject of this kind, his creative imagination set freely to work and built its own system. There is nothing to hamper the free play of his gifts, and he felt at home in the incredible and the unknown. What Wordsworth found in the world of vision, Coleridge found in the supernatural. He was both fascinated by the unknown and in some sense afraid of it. It gave him the thrill of excitement which he needed before he could concentrate his mind on a subject, and through it he sharpened his vision and purified his mind of many disturbing and distracting elements. Like all great poetry, "The Ancient Mariner" suggests prospects and possibilities beyond its immediate subject. Indeed, it is a great poem largely because it does this. In creating this imaginary world Coleridge offers an alternative to familiar existence which is at the same time an illuminating commentary on it. Both in the main plan of the Mariner's crime and in the spiritual forces who battle over him, Coleridge emphasizes the state of man between persecuting horrors and enchanting beauties. "The Ancient Mariner" is his greatest poem because he put most of himself into it and in it spoke most-fully from his inner being. The brilliant reality which he gives to this invention of his imagination comes from his prophetic insight into himself. His poem creates not a negative but a positive condition, a state of faith which is complete and satisfying because it is founded on realities in the living world and in the human heart. *The supernatural element appealed to him with a special power and was responsible for his finest work. He had a remarkable sensibility for the physical world.